An inch of rain doesn’t sound like much. But if your average rainfall was 25 inches per year, your annual rainwater potential is 28,000 gallons a year. If your gutters are clogged, imagine the silent damage being done to your home. When shopping for gutters, homeowners have two options: sectional and seamless gutters. Traditionally, gutters came in sections that were pieced together, leaving seams for water to creep through. With proper installation and regular maintenance of re-applying sealant, leaks can be preventable. However, seamless systems are rapidly growing in popularity. Seamless gutters require a professional installer, but once the job is complete, the maintenance is effortless. A rain gutter’s main purpose is to funnel water off the roof and away from the home. Too much water on or around the home can damage the home’s foundation and structure. Gutters collect the water and direct it to the downspout which carries the water down to ground level. Gutters prevent a lot of problems when it comes to your home. They protect it from flooding, infestations, mold, paint damage, rotting and more. Vinyl is the least expensive option, but the color choices are limited. It won’t rust or rot, but extreme weather conditions can cause them to become brittle. Heavy rains and snow can also cause it to bend and bow. Aluminum is a popular, low-cost metal that won’t rust and comes in a variety of colors. Aluminum is known to last longer and is a durable option for Milwaukee homeowners. Steel has three options to help prevent rust or eliminate it completely. Galvanized steel, which is coated with zinc, lasts eight to 15 years before rust appears. Galvalume is a zinc-aluminum alloy blended with chrome and has a 25-year warranty against rust. The most guaranteed material to fight rust is stainless steel. Zinc is a material typically chosen based on locality. Depending on the proximity to saltwater, zinc will last 30 to 50 years, but it’s vulnerable to acidic runoff from cedar-shingled roofs. Copper will never rust and will never need painting. Plus, the warranty for copper lasts 100 years in any climate. However, copper is the most expensive option by far. There are many benefits that seamless gutters provide that traditional sectional gutters simply cannot. Below are some of the best features of seamless gutters. Easy installation – While putting seamless gutters on your home isn’t a DIY project, the task will be easier than installing sectional gutters. A special machine is required to put the seamless gutters into place, but the process is easy and quick because it’s a single long piece of material. Less maintenance – Since seamless gutters are made from a single piece of material and the only joints are around the areas that stretch over the corners. The fewer joints means less debris accumulation. Seamless gutters are also more firmly fixed against the house, therefore pests and birds cannot make their homes into the cracks between the gutters and the home. Durability – Seamless gutters have fasteners and joints only at the corners and downspouts. The fewer joints and seams that can get worn out, fall apart or leak the longer the gutter will last. When the seams are eliminated, gutters can stand up to heavy rainstorms and strong winds. Variety of materials and colors – The same materials that are used for sectional gutters can also be used for seamless. However, the color can be anything that you feel goes best with the exterior of your home. Seamless gutters have the luxury of having a baked on enamel finish, meaning they’ll never require a paint touch-up. Better moisture control – With fewer openings for water to get in, a seamless gutter is more effective in keeping water away from your home. With less moisture developing within your home, meaning less chance for mold, mildew and structural damage. Aesthetics – Seamless gutters are like the customized floor plan to your new home. They can be personalized to the homeowner’s preferred style, size, design and color. They simply look better and add curb appeal to any home. The fact that homeowners can personalize the color to match the exterior of the home makes a huge difference in aesthetics. One of the main benefits of having seamless gutters is the fact that it’s an easy installation. Sectional gutters are a DIY product, but seamless gutters require a professional. With sectional gutters, you can piece them together until you have the length you need for each particular side of your home. With seamless gutters, they’re made on the spot in custom sizes to fit the exact size of your home. 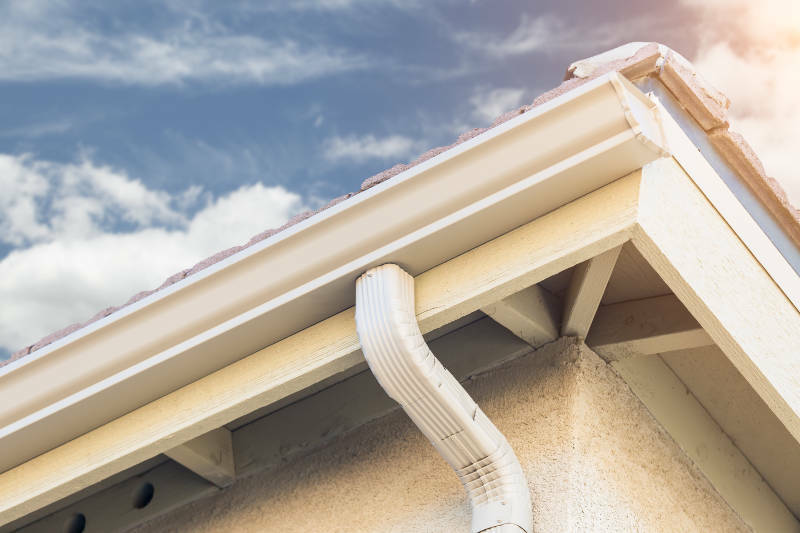 There are many warning signs that indicate your gutters need to be replaced, and it’s important that you don’t ignore them. Some obvious signs to look for when deciding if you need a gutter replacement are peeling paint, water damage and finding loose screws on the ground. Subtle warnings signs include lines or erosion in your landscape below the gutter, mold in the area below the gutter, cracks in sidewalks or driveways and dips in gutters. As a homeowner, do not let your gutters go unnoticed and untouched. They play a key role in your home’s ability to fight against water damage, mold, mildew and more. While seamless gutters may be a little more expensive to install, you will end up saving money through fewer repairs. Overflowing gutters can lead to expensive damages to your home. Landscaping costs due to erosion can cost anywhere from $100 to $1,000, rotten siding due to leaks from water damage is near $2,500, a flooded basement clean-up can cost up to $7,000 and cracked of shifting foundations can cost up to $12,000. Seamless gutters make life easier. They help your roof system manage the flow of water, no matter what the weather brings. Seamless gutters are an investment in the longevity and integrity of your home. In the end, the benefits outweigh the little extra cost. For all your gutter needs in Milwaukee, choose Feldco. We’ve been satisfying customers for over 40 years and know what it takes to improve your home. Get a free quote online for your new seamless gutters.